The final frontier in bath bombs, this set will take earthlings to a relaxing galaxy far, far away. 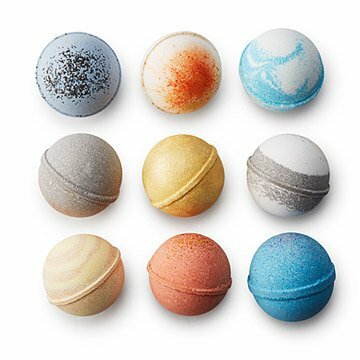 The final frontier in bath bombs, this nine-piece set—eight planets plus the sun—will take earthlings to a galaxy far, far away from the gravity of daily life. Indulge in the effervescence of natural ingredients, including mica, orchids, sandalwood, saffron, and honey — or gift the set to your favorite stargazer. Handmade by Mazzi and Erez Peled in Texas. An enticing blend of sweet black raspberry balanced with mellow undertones of musk and Vanilla. Adorned with poppy seeds. Woody, natural feminine and romantic with notes of orchid, ylang-ylang, sandalwood and patchouli. An exotic blend of myrrh, orange, ginger, nutmeg, cinnamon, caraway seeds, vanilla and cloves. Enriched with detoxifying activated charcoal and sprinkled with bronze mineral mica. Fresh floral jasmine with hints of citrus peel, ginger, nutmeg, and exotic spices. Hand coated with golden mineral mica. A fresh and clean blend of soothing Lavender, Clary sage and Eucalyptus. Enriched with detoxifying activated charcoal. Sweet and subtle; spicy saffron is corralled by the milky smooth tones of aromatic honey. Layered with detoxifying rose clay powder. A delightfully mysterious bouquet of peony, rose, violet and gardenia. Enriched with detoxifying rose clay powder. An enticing blend of sweet black raspberry balanced with mellow undertones of musk and vanilla. Decorated with mineral mica and raspberry sugar flakes. Baking soda, citric acid, sweet almond oil, fragrance, color. Once upon a time, the daughter of an aromatherapist and natural beauty expert married an entrepreneurial brainiac and photographer. Together, Mazzi and Erez Peled are just where they're meant to be. Mazzi inherited the gift of making invigorating body care creations from her mother, and learned the technical essentials of manufacturing them while studying in Israel. Erez brings his attention to detail and design to their creations, from rich cremes and edible lip scrubs to soaps shaped like cupcakes and popsicles. Each batch is hand-poured, cut, stamped, and packaged in Austin, Texas. Keep in a dry place away from water until ready to use. Boyfriend and I love them! My boyfriend and I love these! We've used two so far. They're beautifully packaged and leave my skin feeling so soft and smelling wonderful! Also, there's no clean-up afterwards, which I love. I'm a bath junkie - other bath bombs I usually wind up having to scrub or rinse the tub (and my skin) afterwards, but I didn't have to with these. This was for my daughter. I loved the idea of the 9 planets. It smelled great when it arrived. My daughter said it fizzed well. It lasts a long time. Four months later she only has one left. I ended up buy another as a gift for a difficult to buy person. These are beautiful and a really cool idea, but unfortunately, the charcoal stained our tub. I submitted a question twice on here asking if this was normal or if there was a secret to removing the charcoal stains, but I haven't received a response. This item had 16, 5-Star reviews. Well, they are absolute garbage. If you enjoy having to scrub your body and tub after every single use, go ahead and buy these. I'll be purchasing a higher quality bath bomb next time. Bought this as a Christmas gift for my sister-in-law who loves space and taking baths. Win-win! Everything about the quality seems great, except it spilled bath bomb dust when you tilt the package. I opened it a little to ensure they weren't crushed and they were fine. Also, I personally think they smell weird but we'll see what the recipient says. I couldn't open the package since it's a gift, but the wright I know is a good sign. These bath bombs also have a strong smell, perfect for the bath. My daughter likes this type of product. It works for her.